Thanks to all who have left such kind messages about our “weather problem”. We are getting ready now to leave to wait out the passing of Gustav at my daughter’s house. She lives near us, but has less large pine trees. We do not want to be here with possible hurricane force winds surrounded by 120 foot pine trees. We are hoping that after just a few days, we can come back home and check on the house. Falling trees are the only thing that I am worried about since we are too far from a shoreline and too high for flooding. We lost five big trees in Katrina, but luckily nothing hit the house. The forecast, at this time, looks a little more favorable for us where we are (30 miles north of New Orleans), so it may not be as bad as first predicted. Yesterday was a beautiful day, you would not know a storm was any where near us. The sun was out and a lovely breeze made securing everything in the yard a little easier. 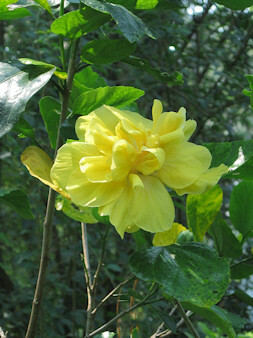 I snapped this picture of a yellow hibiscus just before I moved it to a safer location. I know no matter what happens that the least will be a tremendous amount of debris that will have to be picked up, raked up, and piled up to be hauled off. My attitude is if anything in the garden is ruined or lost, that will only give me an opportunity to try some new plants. If we lose electricity and/or the internet (which we probably will) it may be a while before I can post again. Please keep the Gulf Coast in your thoughts and prayers. Still waiting for Gustav to decide where he is going to go. We have sandbags to place in front of the garage door in case of high rains. The generator is on standby. We are ready to hunker down for the duration. We should know better where it will land tomorrow when it will be three days out. I am still a little anxious, but I’m feeling a little better after seeing the latest hurricane models which predict it will go west of us. We could still be in for a rough period if it doesn’t go to far west of us. It was three years ago today, that Katrina hit the Gulf Coast. Talk about deja vu. I don’t like to even think about Katrina anymore. Keep the Gulf Coast in your thoughts and prayers. Well, we still don’t know where Gustav is going to end up, and everyone around here is getting very anxious. It seems to just be sitting there next to Jamaica, and no one seems able to tell where it is going to be in just the next few days, much less five days out. With so many people trying to make plans to evacuate, hotel rooms are booked all the way to Memphis. It is just getting crazy. Most people are worried because there is so much uncertainty as to where it will end up and do they have to evacuate or not, and if they do evacuate, when do they leave. Sorry, I don’t feel much like posting about gardening tonight – too anxious. Though when I was watering the garden, I did see that the night blooming Jasmine has buds. Maybe when they open, I’ll be in a better mood and post some photos. 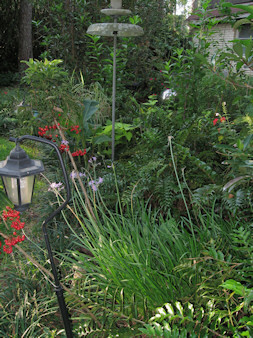 By the end of summer the garden has grown into the lush setting I envisioned in the late winter. This is the first year that plants are large enough to have filled in just about all areas of the garden. The back corner is an example of this. You can’t even see the neighbor’s yard next door. To the right of that area, it is just as thick. The beds surrounding the patio echo the same verdant growth. I can hardly believe that just a few years ago every thing seemed so small with big spaces between plants, and now look at it. I just hope that TS Gustav doesn’t turn into a big hurricane and hit us, ruining the garden and much worse. I really am worried about this storm. Even though it is days away, the authorities are already talking about a mandatory evacuation. I would hate to have to go through a Katriana all over again. Though it is too early to tell where it is going, I am trying not to worry and am hoping it just fizzles out down in the Caribbean. Please, keep good thoughts for the Gulf Coast. Yesterday, I wrote about the end of summer and how the garden reflects this. 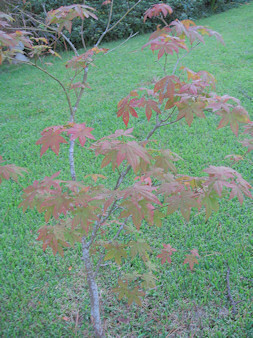 One plant I forgot to mention is the Japanese Maple. This little tree has been a very slow grower for me. Even though it is still small it is one of the few trees that show any fall color. We are too warm here for the trees that fire in brillant reds, yellows and oranges come autumn, but this tree does show nice color if it isn’t too dry. It really is getting too much sun since Hurriacane Katrina took out several tall pine trees that gave it afternoon shade. It remains mostly green in the summer, but it is just starting to show some color. If we continue to receive moisture, the leaves will stay on until fully red. The time to transplant trees and shrubs down here is in the winter. I think this is the year I will have to move this little guy to a shadier location. Maybe by doing that, in a few years, there will be a bigger tree sporting more colorful leaves. Even though we will still get many days with high temperatures in the 90’s, you can tell that summer is on the wan. Next Monday is the end of meteorological summer, and, even here where warm weather continues into November, there are signs that summertime is just about over. The hydrangeas’ flowers are all turning from green to a rosy pink with flecks of brown. A sure sign that that they won’t last much longer. If picked now and dried they make for great fall arrangements. Even in decline, the hydrangea’s flowers are still striking. Before you know it, the leaves will start to turn brown and drop off. Another sign is the blooming of the Sweet Autumn Clematis. Its bloom period is at its peak right now. The star-shaped flowers cover the vine, and the bees are busy visiting each one. The Beautyberry’s fruit have all turned that gorgeous magenta which shows the berries have fully matured – another sign that autumn is knocking on the door. The little coleus that was planted in the spring, is now a large mass of colorful leaves. It is hard to believe that such a small plant has grown so big by the end of summer. And finally, one last sign that summer is coming to an end. The Texas Star is blooming prolifically, something it does only as summer comes to a close. So, these are the signs that summer is winding down. Now, I am on the lookout for the first of the fall flowers to show up as the wheel of time slowly turns. Today we started getting the remnants of TS Fay though it is not as bad as the weather people thought it might be for us. But, this meant no garden work because it was raining when I woke up, and it rained steadily but lightly all day. There are puddles all over the yard since we had had so much rain earlier in the week that the ground is not absorbing it fast enough. Even though it was windy, at least we didn’t have high winds. 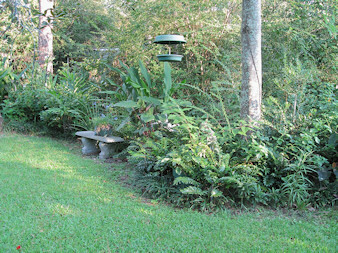 Having periods of a lot of rain is typical for the Gulf Coast, and it can make it difficult to garden. Plants that can’t take the high rains just won’t make it and that is why drainage is so important here. It is best to build up the garden beds and/or plant things high. Earlier in the summer, we were having a drought with weeks without rain. We have had over seven inches of rain since August 1st. Of course, that is nothing compared to what poor Florida had from Fay, so I’m not complaining. Since going back to work, I only have the weekends to garden, and I would have liked to have been able to spend some time doing that today. Well, maybe next weekend will be better. After all it will be a three day weekend, and I should get some time to garden. Today we had good weather with a nice breeze (thanks to TS Fay) and I was able to work in the garden. I cut back several plants that had become overgrown in the last two weeks. Plants like salvia, sweet potato vine, and a few other things. While I was cutting back the daisies, I noticed what I assumed were little bulblets on the Easter lilies. Since this is only the second year I have grown any type of lily, I am learning as the plants grow. From what I have read, I should be able to plant these and get more lilies. As the photo shows, there is one of the little bulblets. Some of the lilies have them closer to the ground. I’ll have to read up on how and when to plant them. This is one of the aspects of gardening that I find so interesting. There is always something new to learn. Today, I also cut off the flower stalks of the agapanthus. I had left them on longer than I usually do and some had ripe seeds. I collected some of the seeds to see if I can grow some agapanthus from seed. I really do not need any more Lily of the Nile, but sometimes I just like to see if I can grow things like that from seed. So, it looks like I soon may be trying to propagate some lilies. Something just occurred to me. 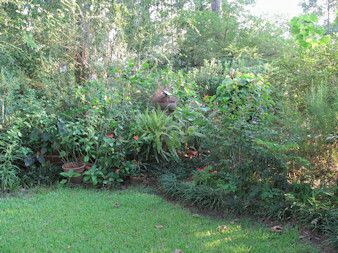 I have a great many plants in my garden that belong to certain families. For example, the clerodendrums. I started out with cashmere bouquet (clerodendrum bungei) and soon there were many more clerodendrums in the garden. There is the bleeding heart vine (clerodendrum thomsonia), Turks turban (clerodendrum indicum), blue butterfly (clerodendrum ugandense), and glory tree (clerodendrum fragrans). I would like to add pagoda flower and musical notes, both cleroderdrums. I never meant to have so many cleodendrums. In fact, when I first bought some, I didn’t even know they were clerodendrums. But, I guess I just like that family of plants. The same thing happened with the gingers. I started out with butterfly ginger and soon added others. I have both the variegated and green shell ginger. Hidden lily ginger is my favorite. Then, last year pine cone ginger was added after attending a plant sale at the New Orleans Botanical Gardens. I know that some people have collections of plants like African violets or bromeliads, but I never expected that I would have a collection in my garden. Do you have any favorite plant families, and are they in your garden? With the heat of August in full swing, the tropicals in my garden are putting on quite a show. The hibiscus bushes are really putting out the flowers now that we have had more rain. As I have written before, I only grow the double flowered ones. The reds, peach, and yellow ones have been particularly pretty the last few days. In our climate these will continue to bloom into the winter. In fact, I’ve had blooms in December when it has not been too cold. But, it is the summer when these hibiscus really shine. Here’s an update on the long awaited Bird of Paradise flower. It has finally opened up completely. I am so glad I didn’t give up on it when it took so long to eventually show a flower.